No Pay on Board vouchers allows for a quick and easy check-in, not to mention a better travel experience! 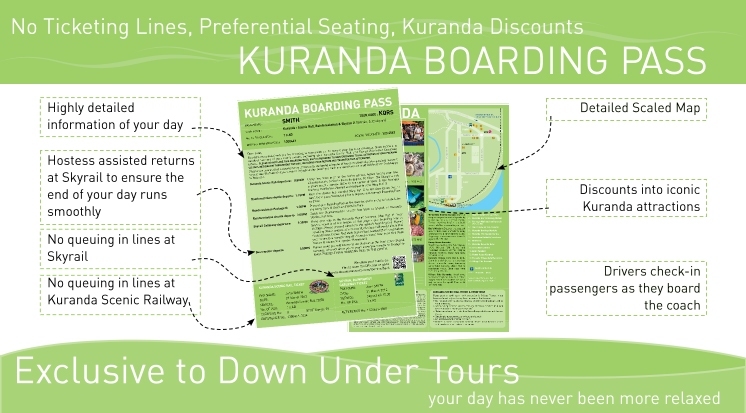 You can go directly to the boarding area of Skyrail rather than having to wait in line for ticketing as the Kuranda Boarding Pass incorporates you Skyrail ticket. Ensuring your day runs smoothly. Includes tour itinerary, timings and also handy hints on how to make your day as enjoyable as possible. Including Birdworld, Australian Butterfly Sanctuary, Koala Gardens, and Rainforestation. With a key to highlight points of interest such as free shuttle bus departure locations, cafes, attractions and ATMs. Assisted returns from Skyrail to ensure a smooth ending to your day. We have partnered with TripAdvisor, the world's largest travel comunity, to bring you even more traveller reviews.